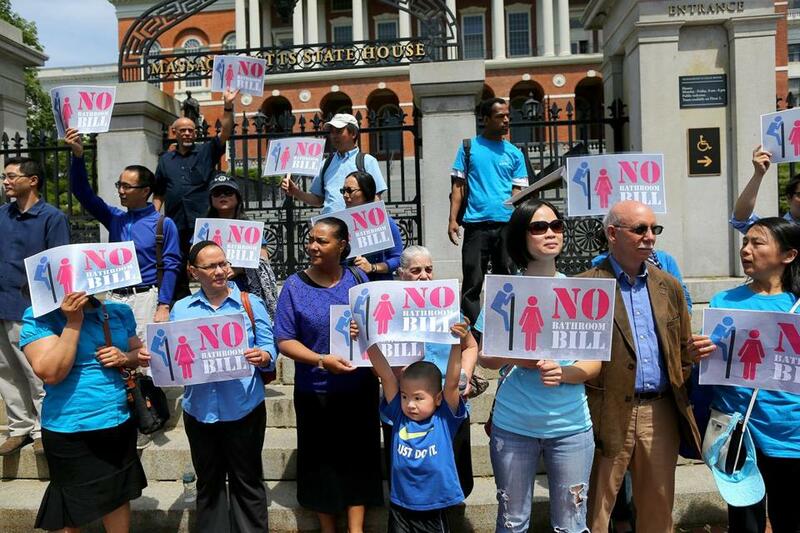 Hundreds protested against the transgender bill at the State House on Wednesday. The House of Representatives passed a controversial transgender public accommodations bill Wednesday after hours of heated debate. The bipartisan vote was 116-36. Afterward, proponents cheered. Outside the House chamber, opponents, holding images that showed a man peering over a barrier at a woman, shouted “Shame on you!” as legislators walked by. The bill would allow people to use the restrooms and locker rooms that match their gender identity and would protect transgender people from discrimination in shopping malls, libraries, restaurants, and other public accommodations. The House version is different than the one passed earlier by the Senate, so the two must be reconciled. Governor Charlie Baker has said he would sign the House version of the bill if it reaches his desk. During the House debate Wednesday proponents framed the legislation as a great leap forward for civil rights. “You can’t tell somebody it’s OK to work at the diner, but not OK to sit at the lunch counter. We learned that a long time ago,” said Representative John V. Fernandes, a Milford Democrat who, as a chairman of the Judiciary Committee, helped write the bill. Representative Benjamin Swan, a Springfield Democrat, said he knows about discrimination as a black person born in Mississippi in 1933. He told a hushed chamber “some here will attempt today to smooth over some of the hurt and pain that has been inflicted on others by allowing this present practice of discrimination against” transgender people to continue. But, he said, smoothing pain over isn’t eliminating it. And he wholeheartedly endorsed the bill. Opponents expressed worry the bill would allow men masquerading as transgender women to enter women’s locker rooms and bathrooms for nefarious purposes. Backers say those concerns are unfounded and not borne out by the reality in the almost 20 states that have such protections for transgender people. 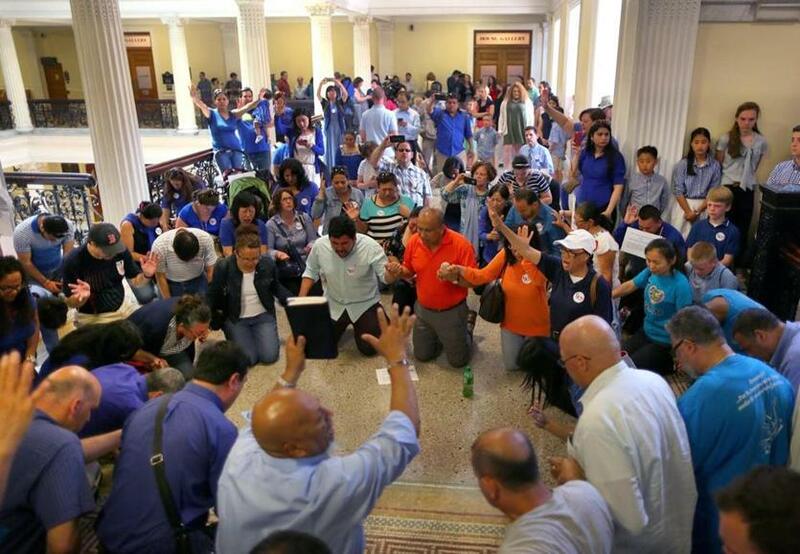 Hundreds of protesters against the transgender bill gathered for a prayer at the State House on Wednesday. 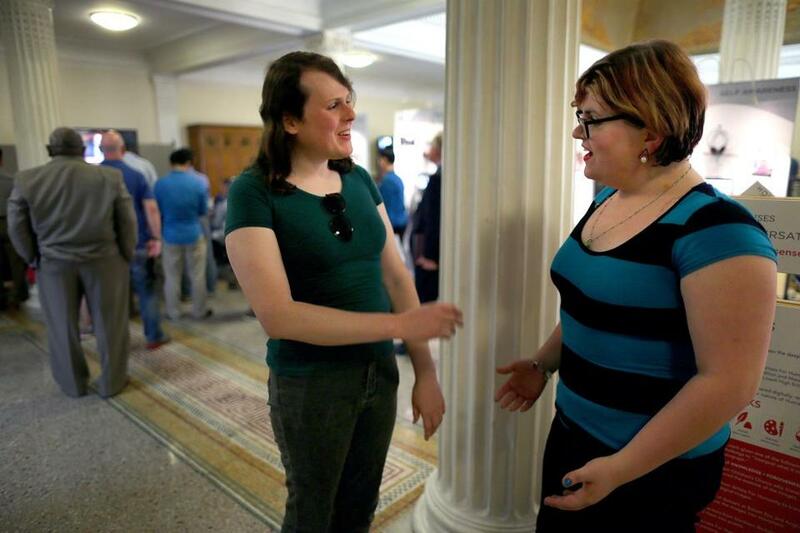 Naomi Wixon (left), of Worcester, and Jordan Evans (right), of Charlton — both transgender — spoke to each other at the State House. 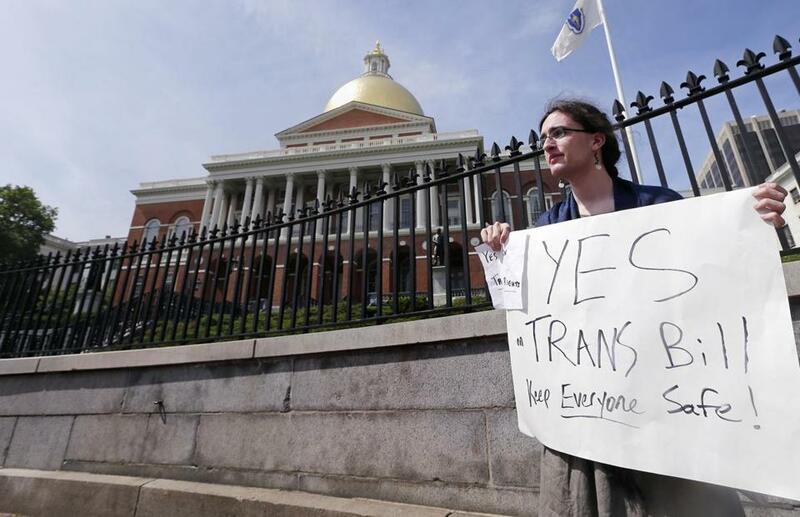 Asa Goodwillie of Watertown, Mass., who is transgender, protested outside the State House in Boston. Joshua Miller can be reached at joshua.miller@globe.com. Follow him on Twitter @jm_bos and subscribe to his weekday e-mail update on politics at bostonglobe.com/politicalhappyhour.